I figure I'll start a new build thread since my last one really didn't have anything useful in it. 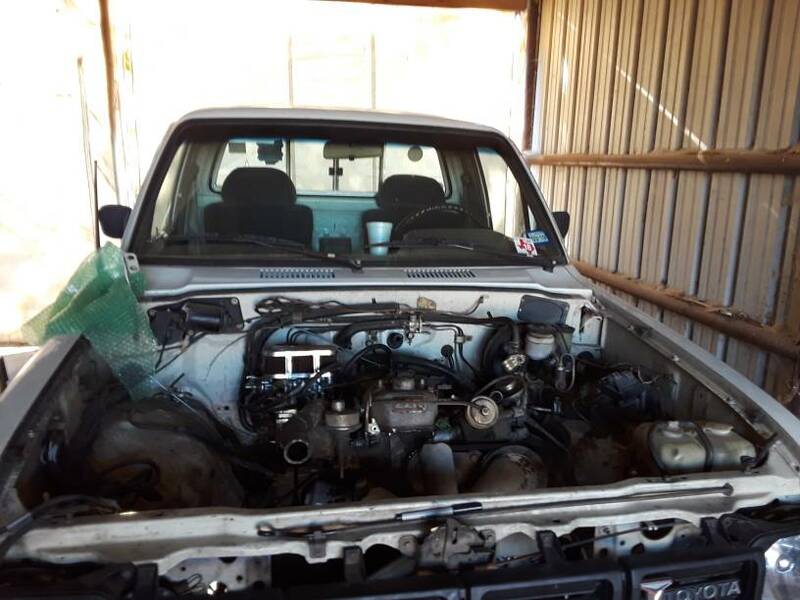 The truck: 1981 pickup 4x4 longed 22r. Mods: Dual cases with 2.28 gears, RUF, 91 f150 2wd springs, Weber 32/36, 5.29's with welded rear open front, steering arm braces, high steer, 35's. Pretty much a basic first gen build at this point. I moved to Texas from California and pulled all the smog junk off and slapped a Weber on it. Now moving back to California I need it to pass smog. 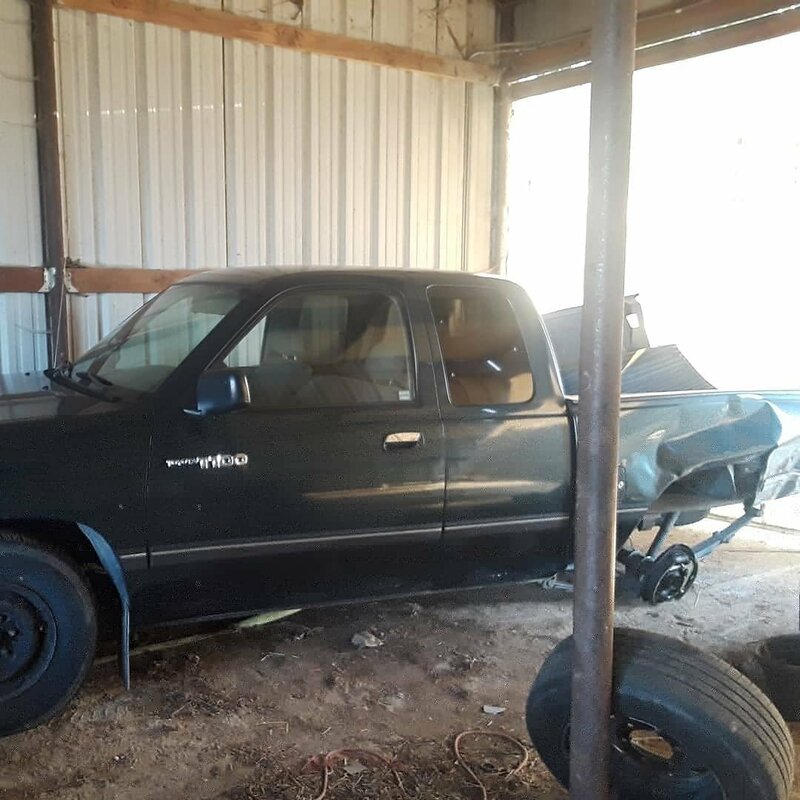 After searching for a 3rz I found a 1996 T100 2wd with a 3.4l 5vzfe that had been wrecked in the rear end. 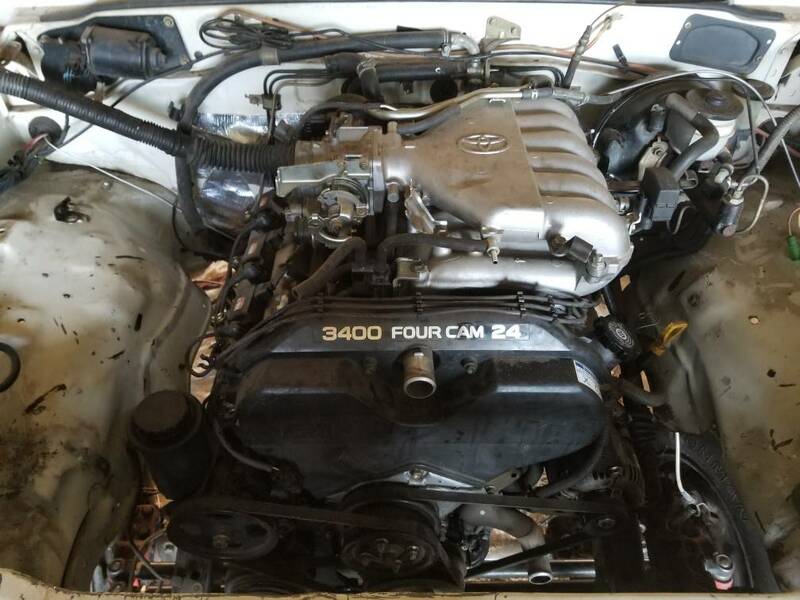 I did some searching and can't really find any complete information on the swap into a first gen or useful information on the engine change process. My plan is to do the swap and have the smog referee sign off on it and documenting everything I can. Here is everything as it sits in September 2018. I spoke with the referee over the phone and got some good info I'd like to pass on. The guy I talked to wasn't some desk jockey and was a little familiar with this swap. 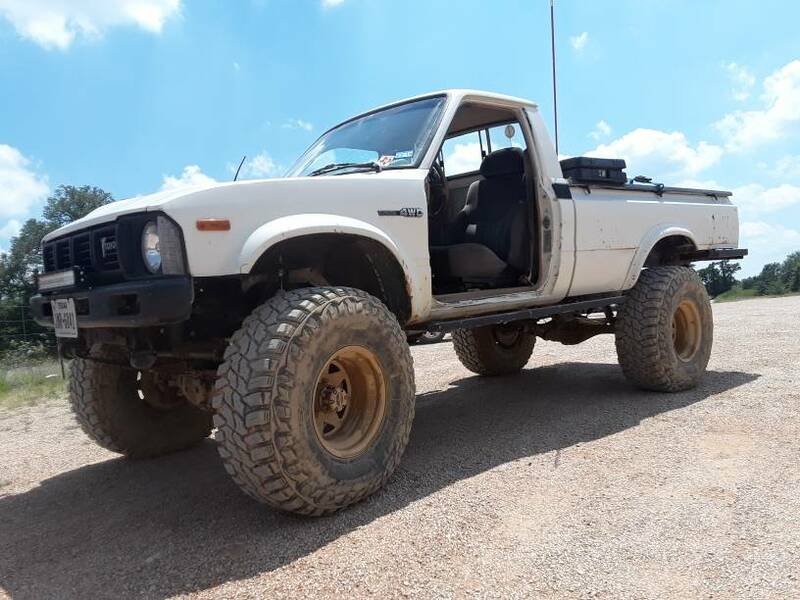 There are 2 weight classes for light duty pickups and this T100 qualified as an acceptable swap. Also, if you are doing this process, the inspecting referee will want a printout from a dealership indicating 1. The ECU is the correct one for that engine 2. The map is the factory map for the engine and not some flashed or tuned map. 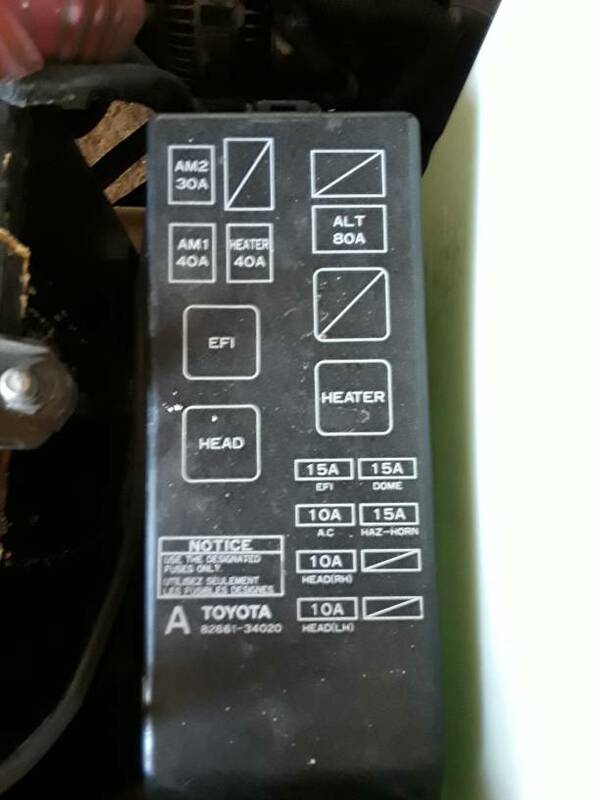 Make sure to leave the ECU label accessible to the inspector so they can verify the information. Also for the crossover, they have gone back and forth about allowing modifications to switch it from side to side. Currently (as of September 2018) it is acceptable to swap it to a driver side crossover as long as it is pretty much identical to the original in tube diameter and length. 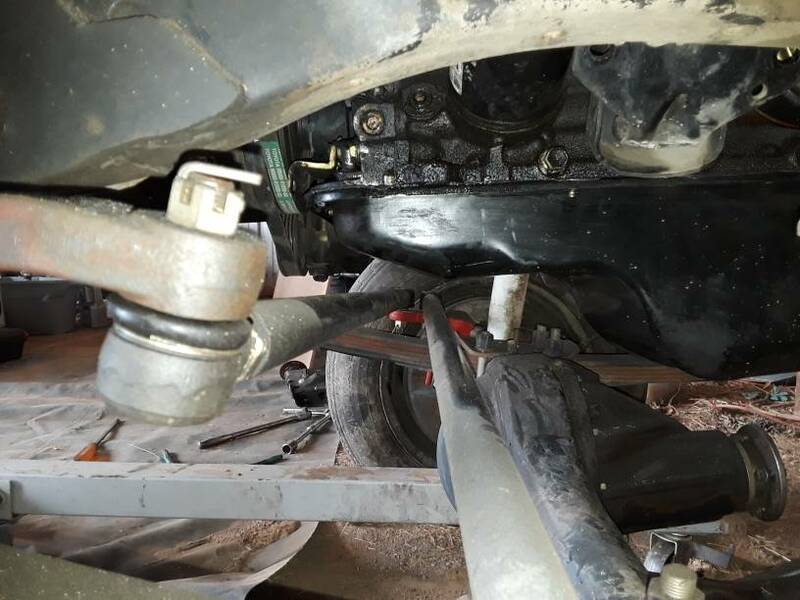 This makes it easy for exhaust routing for older trucks and you can use a 3.0 r150 to keep the slave cylinder on the passenger side which I hope makes it a little easier when I get to that point. watching this one. At one point Zippo and I were thinking about doing this to his potential vehicle which will likely be a first gen. We also thought about doing it to Steve's Ol' Blue 82' long bed neither have happened so I'll be interested to see how you get on. We thought a hole in the hood might be necessary. Some good news! 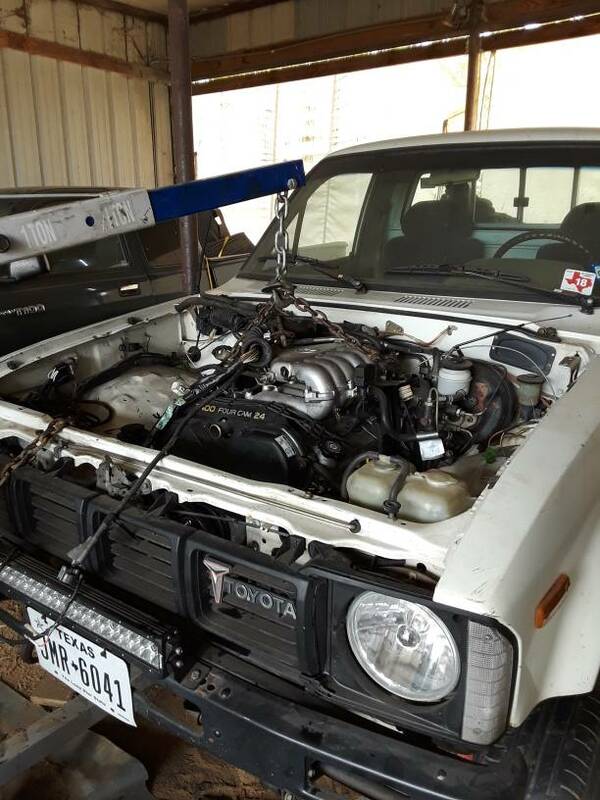 I have been wanting to drop a 1uz in my 83 , but want to keep it street legal. This was another engine I thought about. Worked a little bit on disconnecting everything today. 22r is ready to come out. I have a r150f lined up on Sunday but now I need a v6 adapter and 23 apline input gear for my dual cases. I also need a 2nd gen 22re gas tank. I have found that the 22re fuel pump has adequate pressure needed to run the 3.4. They are rated at about 44 psi and minimum requirements for the 3.4 is 21psi. 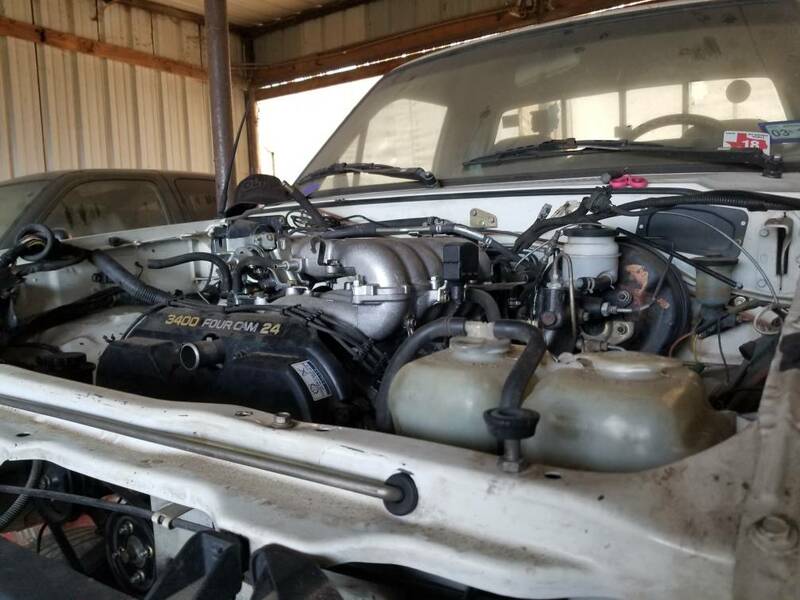 If anyone reading this is near Lodi, CA let me know if you have parts. Also, the emissions and ecu wiring appears to be very simple on the T100. 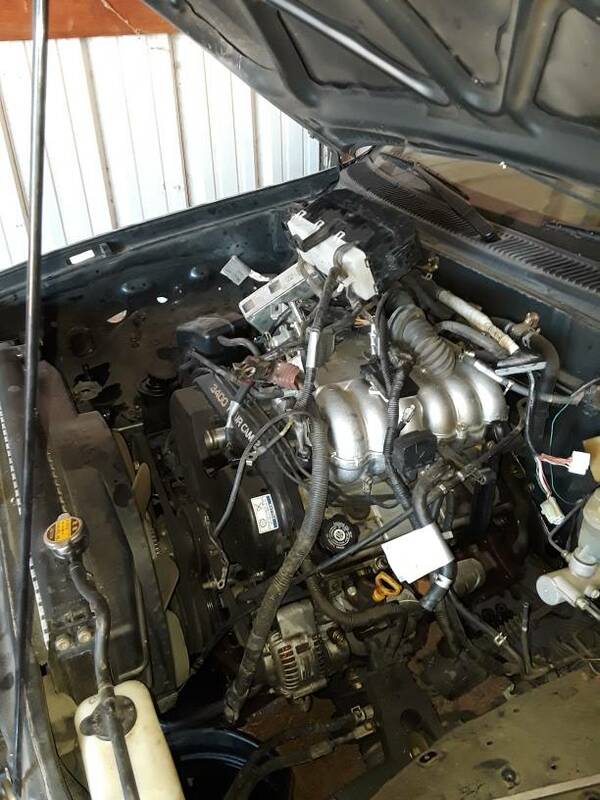 There is no VSS needed for the ecu and the engine harness is in a neat bundle ran underneath the intake. 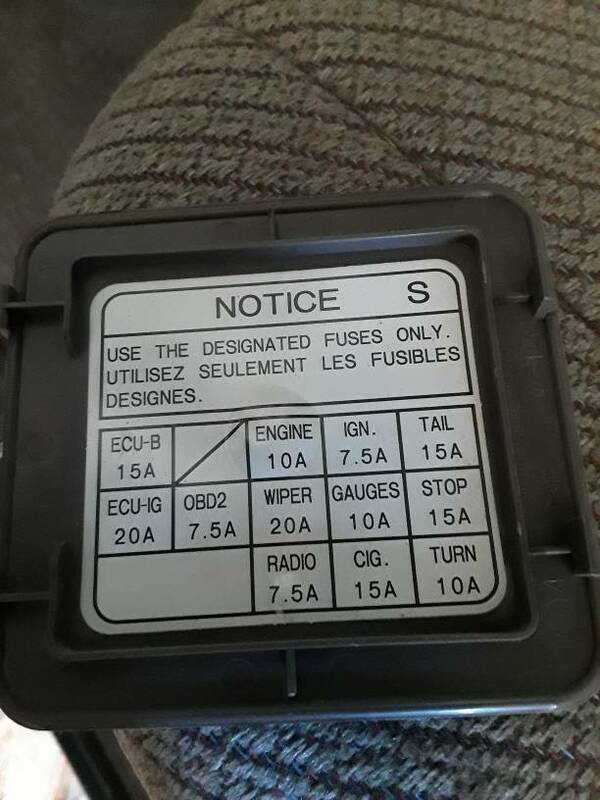 Even the fuse boxes have very little circuits. I got the harneee out of the T100. I'm pretty sure I'm going to be cutting out 75% of the wires from the dash harness. The main portion is 2 plugs that go straight from the ECU to the engine. I also was debating painting the engine bay hut after some purple power and some elbow grease it looks much better. 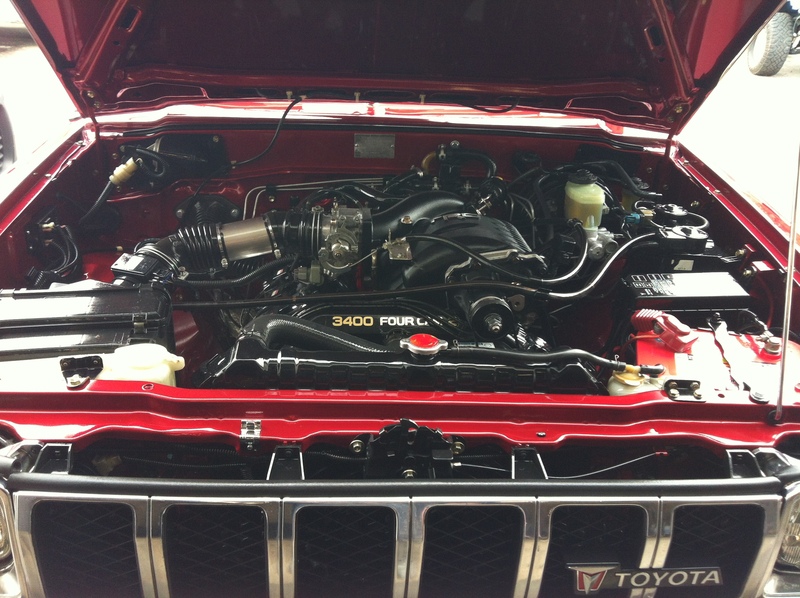 I hope to get the 3.4 out in the next day or 2 and kind of test fit in the engine bay. I'm finding it difficult finding a r150f for a reasonable price near me. Even better, might be getting a set of dual cases with dual 4.7s. This will make a killer build. Nice!! You should consider just swapping in the entire T100 harness and mod as needed. 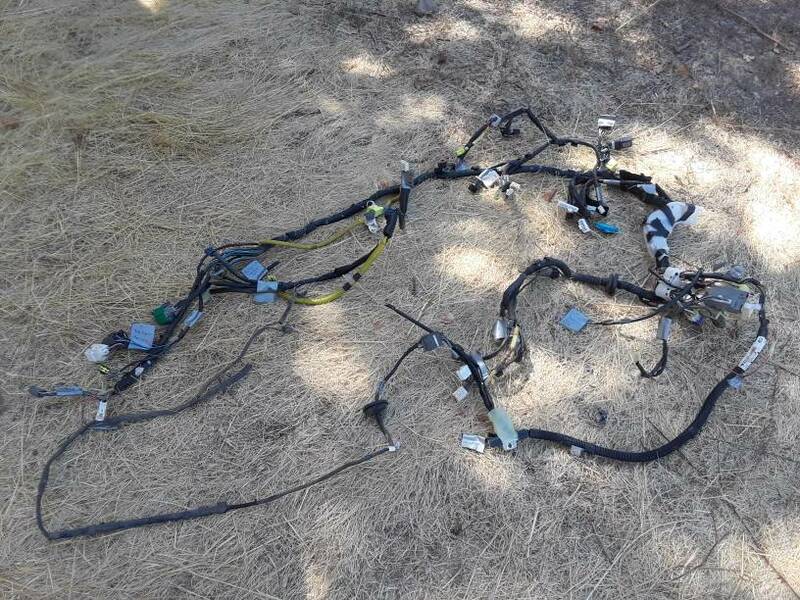 This will keep your wiring simple and also update the wiring harness of your exsisting rig. SC 3.4 in a Trekker? Simply awesome!. I have to ask, what did you use for a radiator? I really like where this is going. Cannot wait to see how it turns out. I will be creepin in the background. More parts have come in. I got the dual cases mounted to the r150 via the Advance Adapters...adapter. 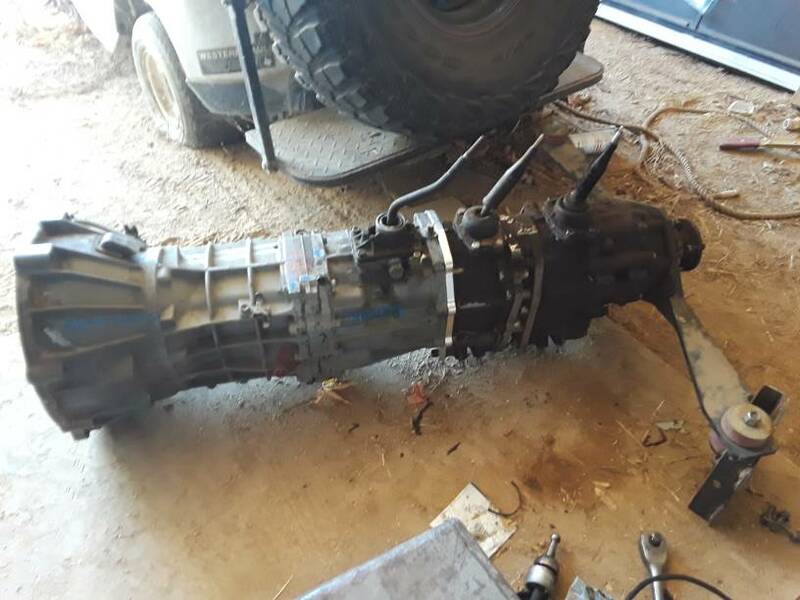 I retained the 21 spline transfer case input gear using their 23/21 spline coupler. Hopefully it holds up :/ Also got a gas tank. 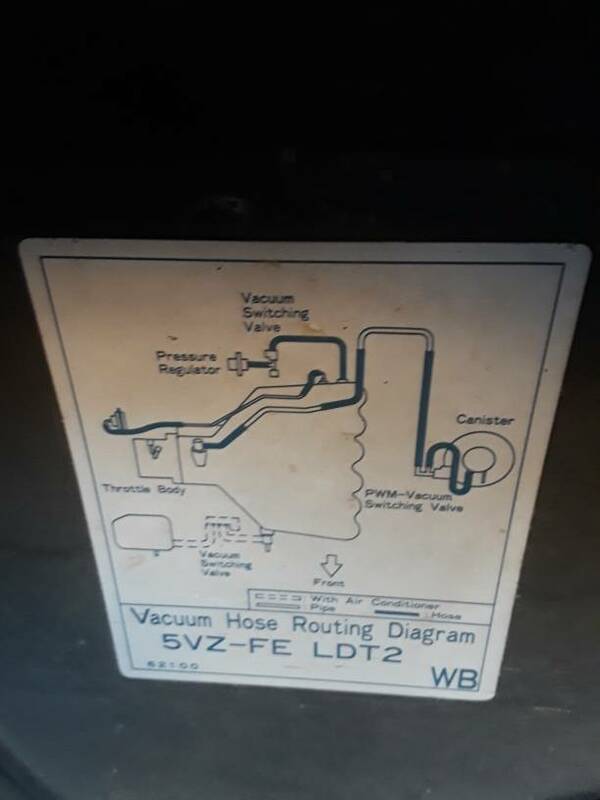 It's from a 1987 22re pickup, and I believe it's a 17 gallon tank. Although the mounts line up, the top half of the tank is taller then the stock longbed 16 gallon tank. Now it hits the bed supports before I can mount it correctly. So at this point I think I will opt for the 2inch body lift for clearance and convenience. However that means I need new sliders and bumpers. 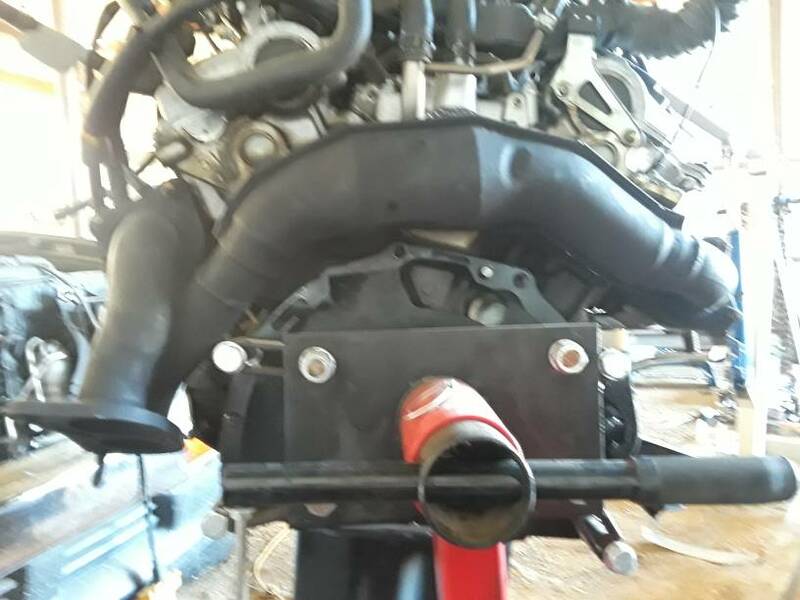 I also sent my exhaust crossover to toyonlyswaps to modify it for left side dump. They retain the factory heat shielding and dimensions so fingers crossed the smog referee will accept it. 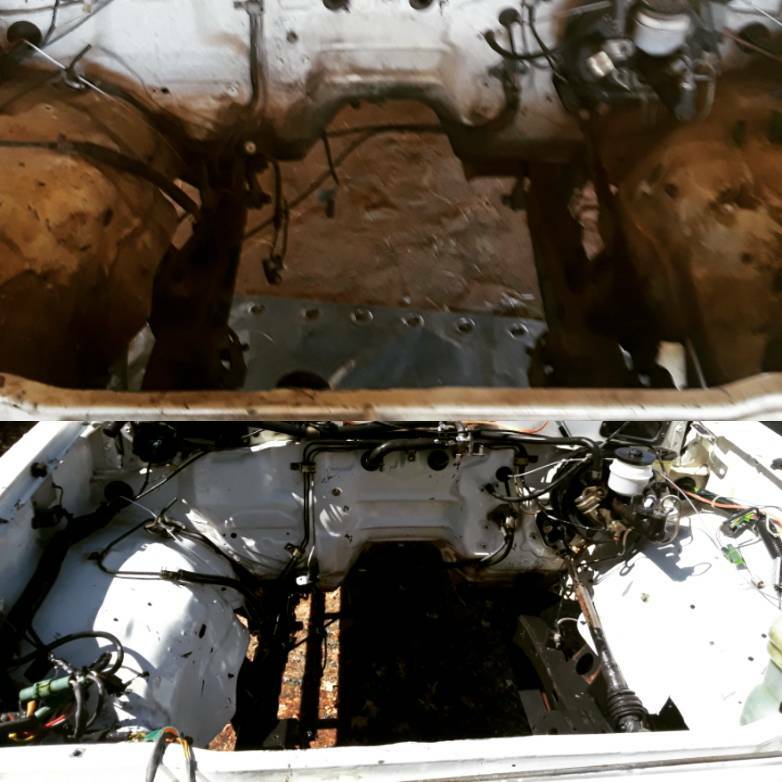 Lastly, the engine mounts are cut out and old fuel lines removed. Now I need to figure out what to do for the high pressure power steering line. 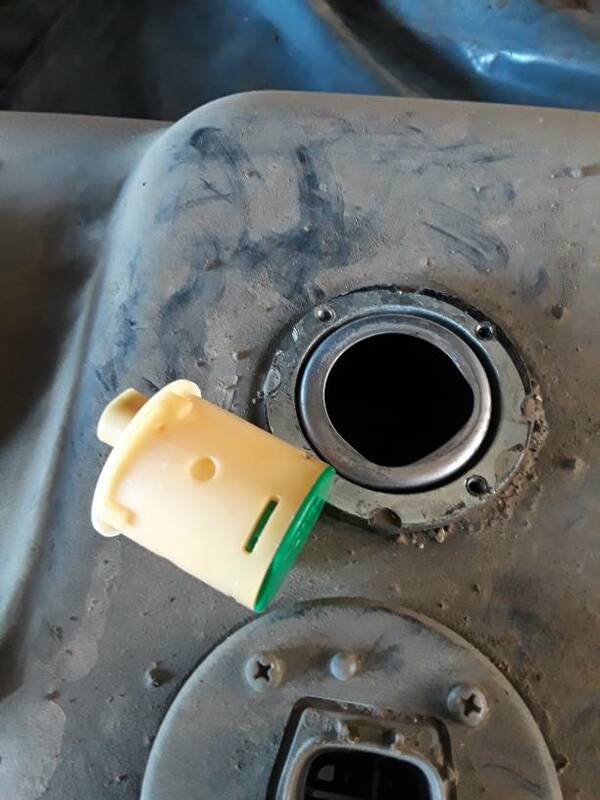 This pump has a banjo bolt with a vacuum switch valve directly connected to it. Maybe I can reuse it some how. Good thing I have a long bed, this thing is long. We found that the HP PS flare would screw into the banjo hole. (at least from RE to RZ. 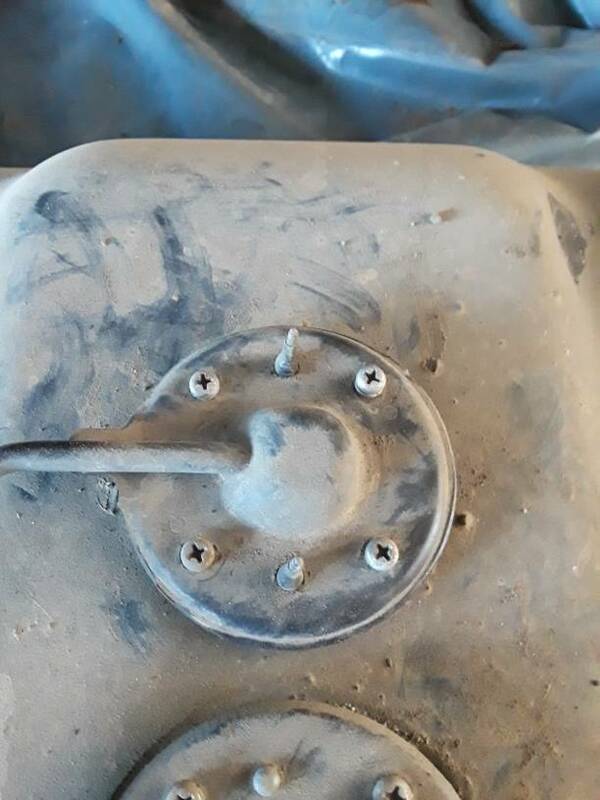 Pat, if you remember our conversation the other day just drop the rear of the tank down 2" with spacers and longer bolts. After looking at it from the outside of the truck it doesn't hang as low as I thought it did so I may try this too. Did the truck ever have fuel starvation issues on the street with the gas tank angled up? Not a bit and I run it on down to below e.
I got the fuel tank situated. 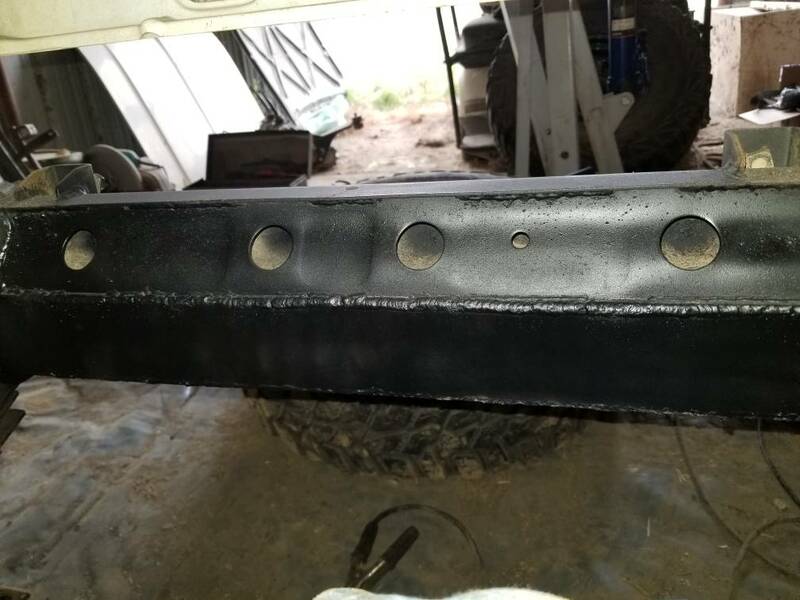 I cut part of the bed support to get the front end of the tank mounted. I'll need to make some 2" spacers for the rear. I also removed the tank from the t100. I noticed there is a little valve on top. 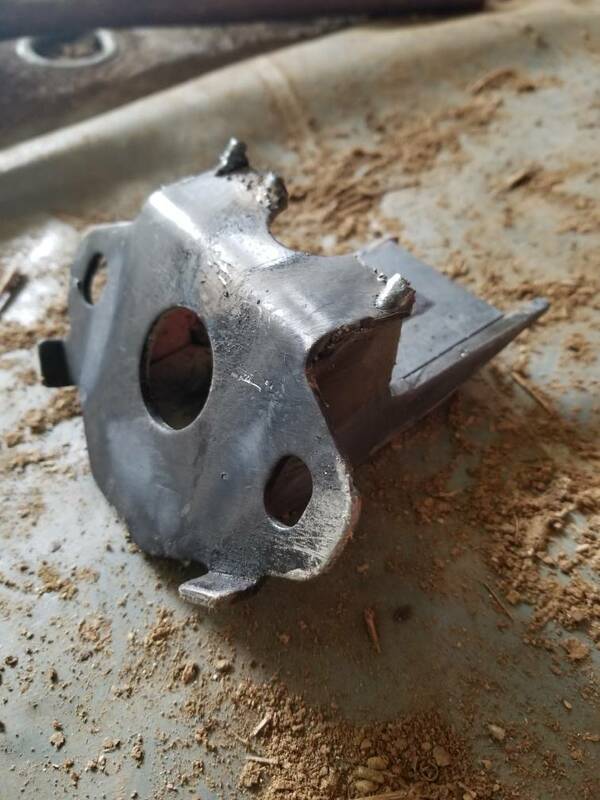 I think its call a rollover or fuel cut valve. Does anyone know if it is crucial to the function of the evap system? 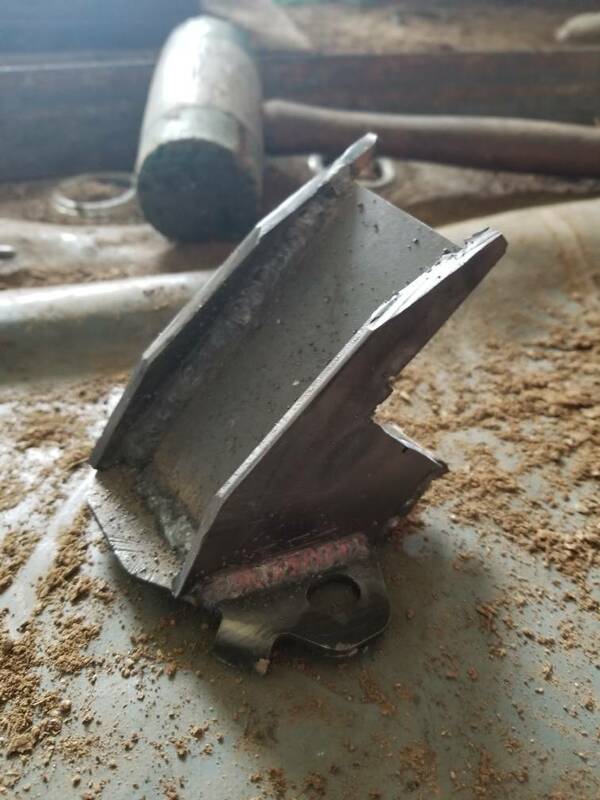 If it is, I will have to find someone willing to cut it out and weld it into the 22re tank it seems. Here are pictures of what I'm talking about. I have no particular experience with the rollover device. 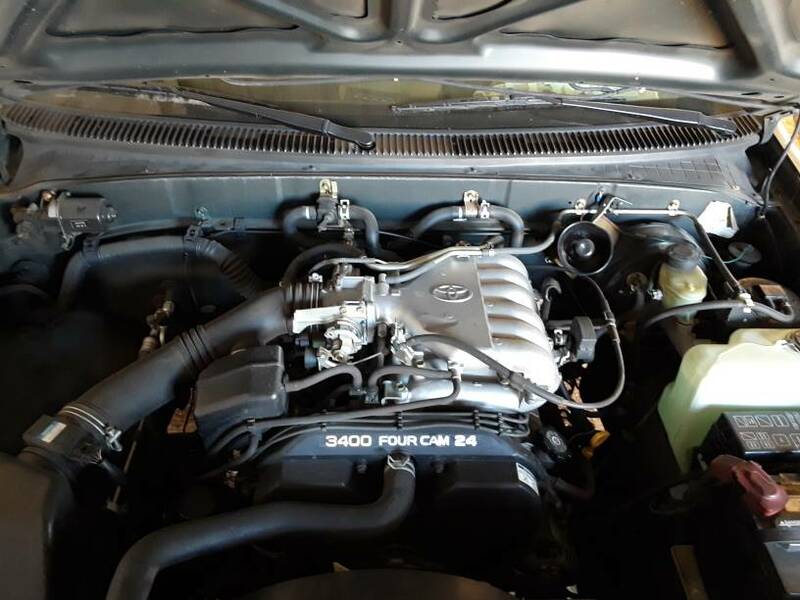 I am running the 22re tank and have no issues with evap. I also deleted egr so this may be an invalid point. I got the crossover back from toyonlyswaps. It seems they made just a couple cuts on the tube and rearranged the flanges so no material is added or taken which, fingers crossed, shouldn't fail the inspection. 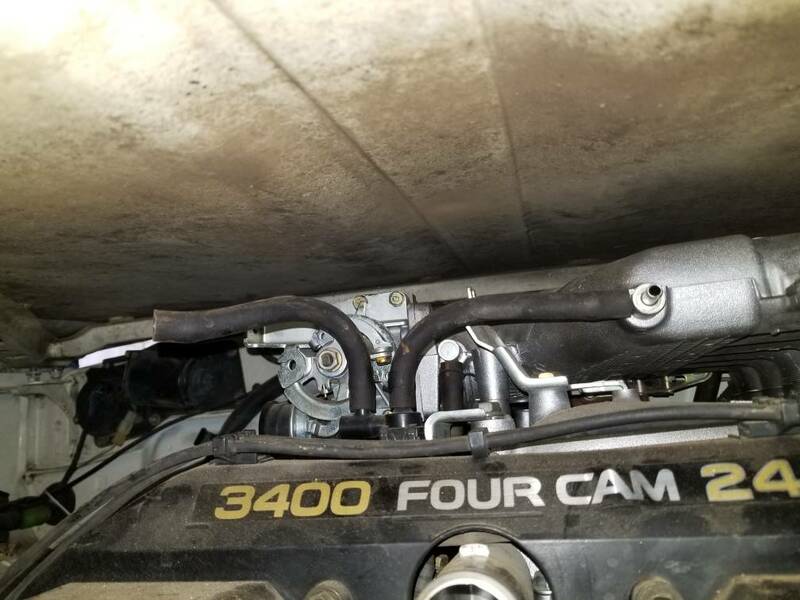 Everything on the back side of the engine has plenty of clearance as well. 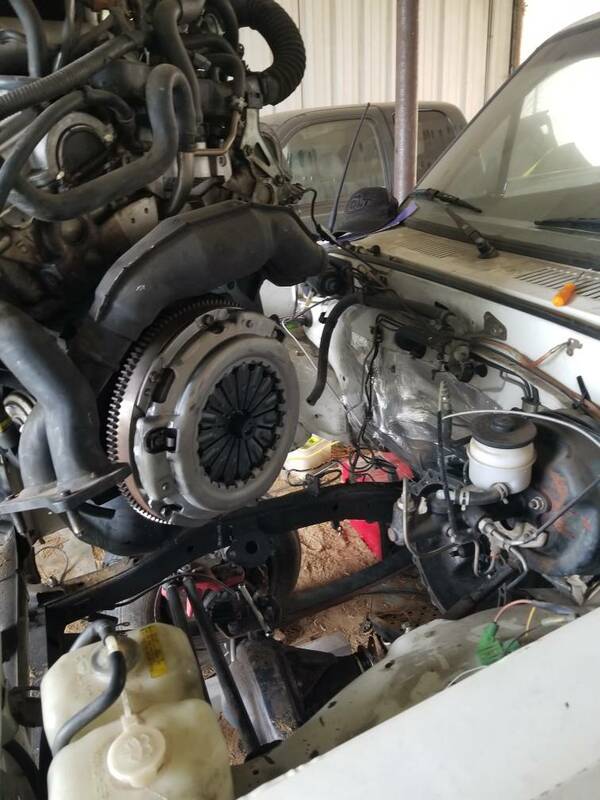 Now that I have this back I'll be test fitting the engine in the truck probably tomorrow. 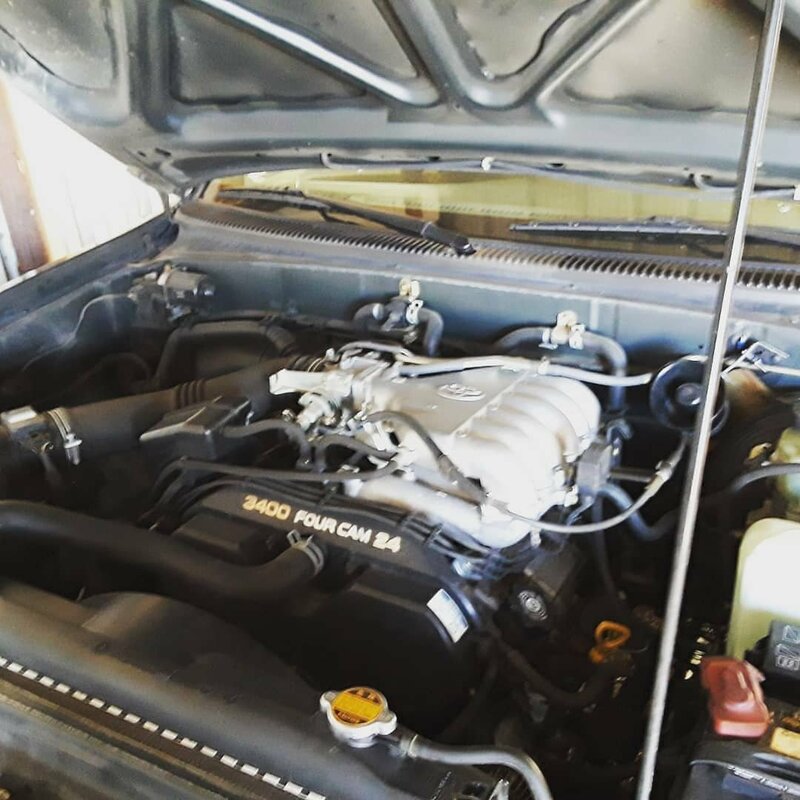 I got to test fit the engine today, and it fits better than I thought it wouldHaha. It will fit between the frame rails fine, even with the A.C. compressor on it. 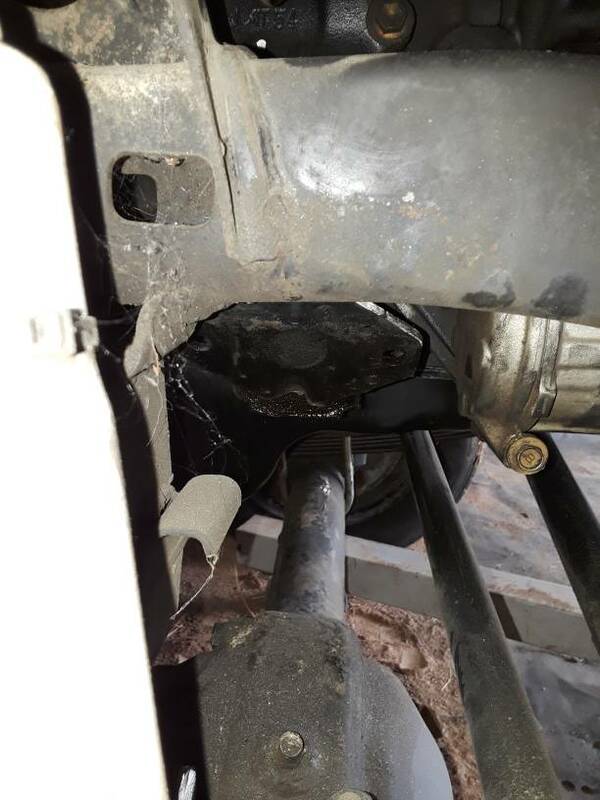 The real problem is the motor mounts. 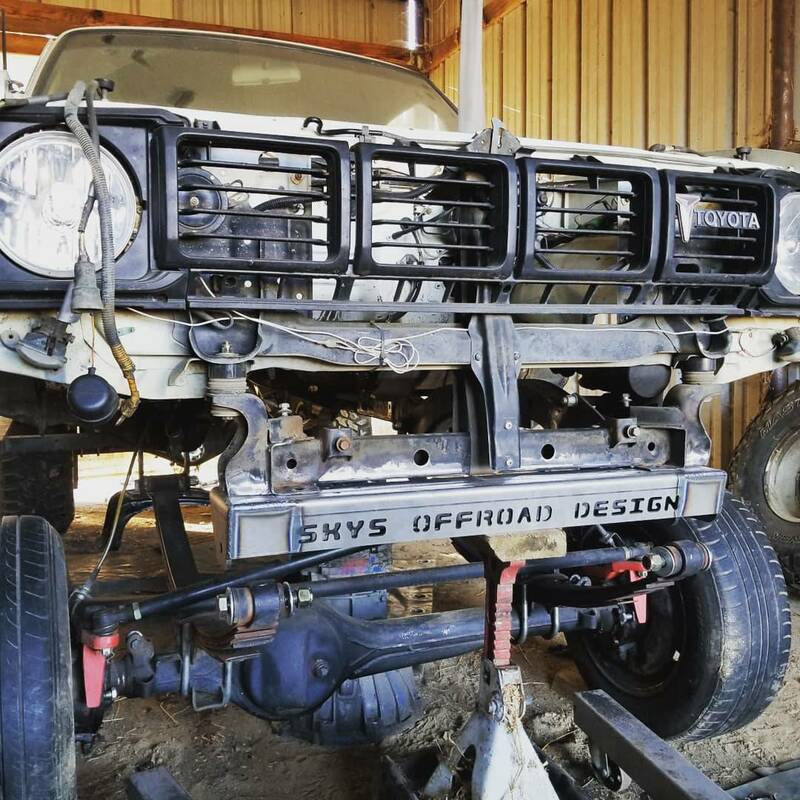 The factory Toyota mounts stick way below the first gen frame. Then I am also running into steering fitment issues. 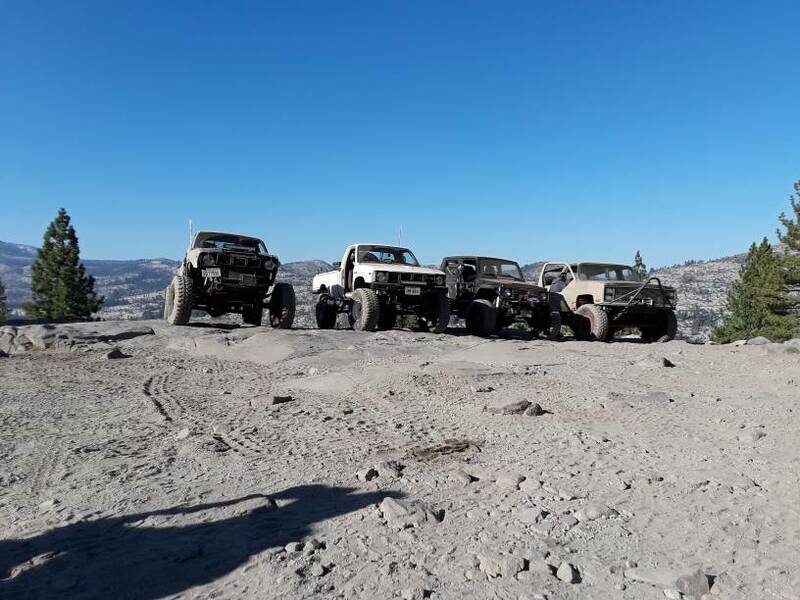 My setup is first gen rears up front with the factory mounts, trail gear high steer, and 5 inch banana shackles. 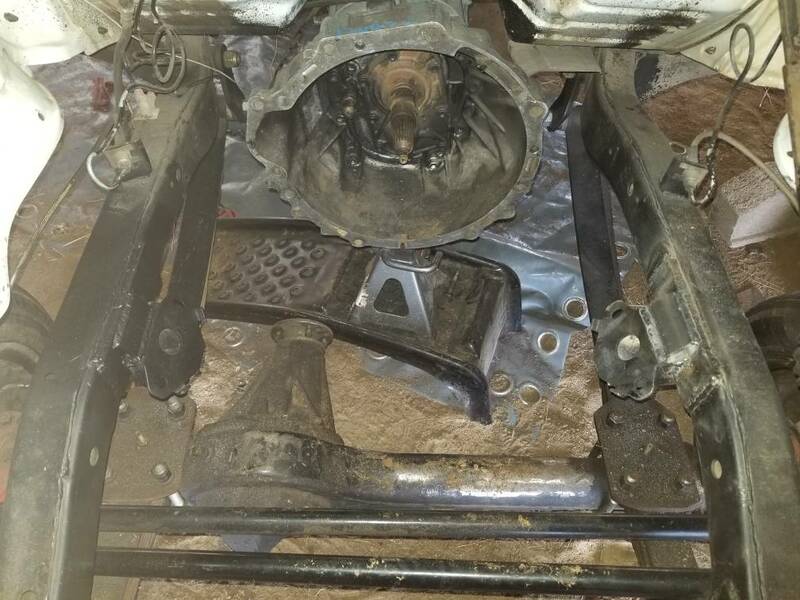 Trying to get this thing to fit without a body lift, I could probably do it if I weld in a new front spring hanger with a 1 inch drop, and either move the spring hanget forward or drill the spring perches on the axle and move it forward that way. I also need to get an actual drop style pitman arm and not just a heated and bent flat pitman arm. Even then, it is questionable is the third member will hit the oil pan or not. Making custom mounts is tricky due to the dipstick routing through the center of the passenger side engine mount, but I think I can figure something out. I'm just being stubborn. 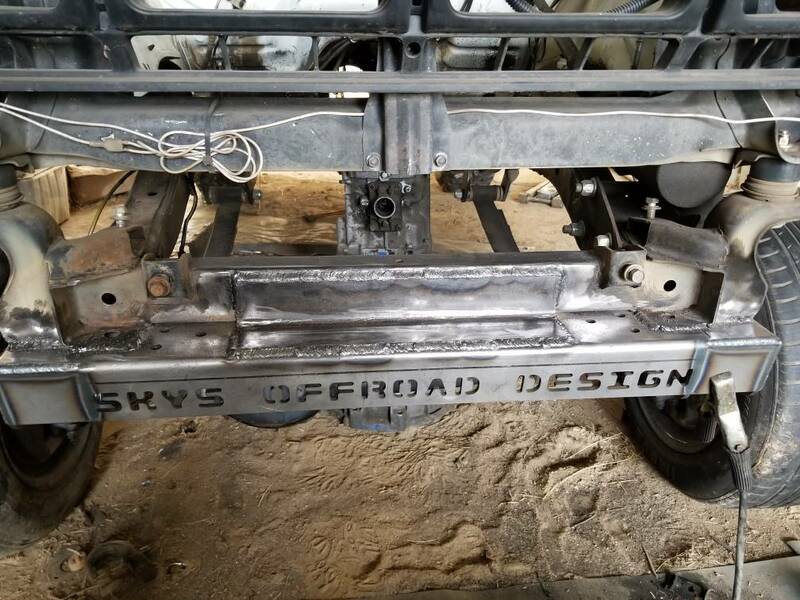 A body lift will make it much easier so I'm going to get a 1 inch on order and a new spring hanger to replace the factory hangers since I have been meaning to do that for a long time. Might as well do it now while the engine is out to make it easier. Looking good! If the ref. allows the exhaust mood I will be ripping out the 22re from my 83. In order to gain some clearance under th hood I opted for the 1 inch body lift and a new spring hanger. Ordered both from Sky's Offroad. 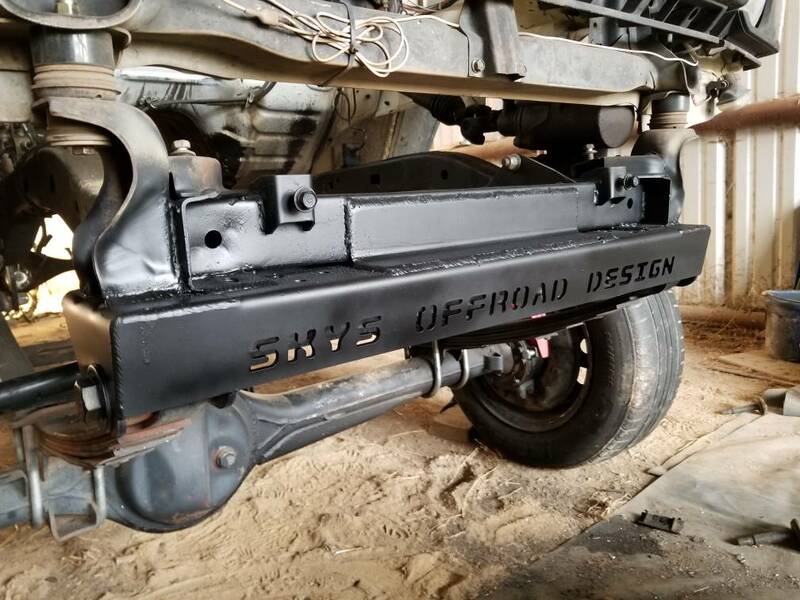 I got the body lift in and the front hanger started enough to put the truck on jack stands so I don't have to trust the hoist to hold it up. I definitely need some playing a bracing so the hanger doesn't rip off the stupid thin Toyota frame. 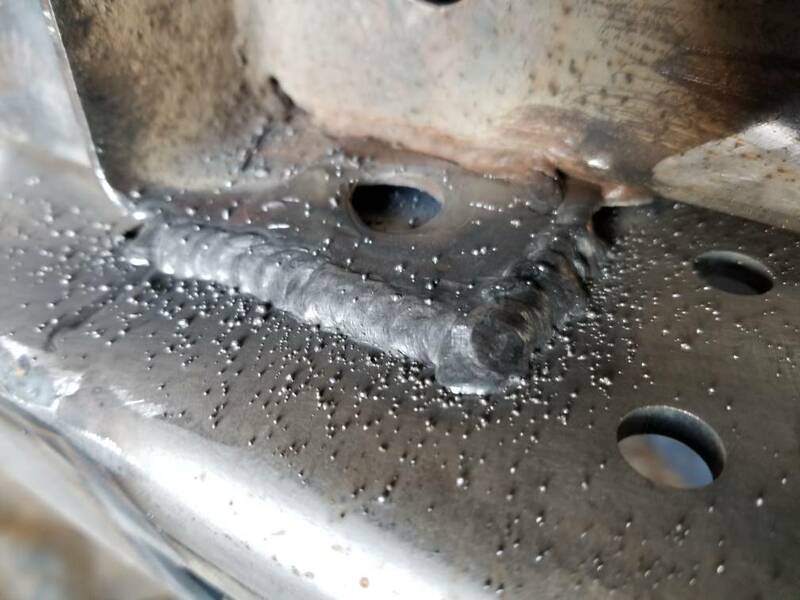 I'm not a pro welder by any means but I think it will hold with proper bracing. I did forget to order a new drop style pitman arm *facepalm* so if anyone has one to spare I can pay to ship. I got the new spring hanger burned in. I'm pretty sure it will hold up to some abuse. 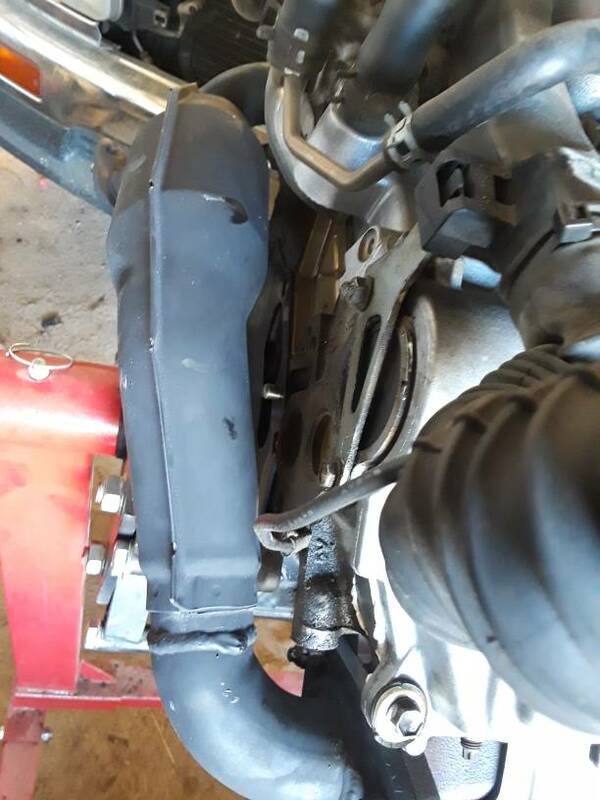 Put in some self adhesive heat shielding for the exhaust crossover. 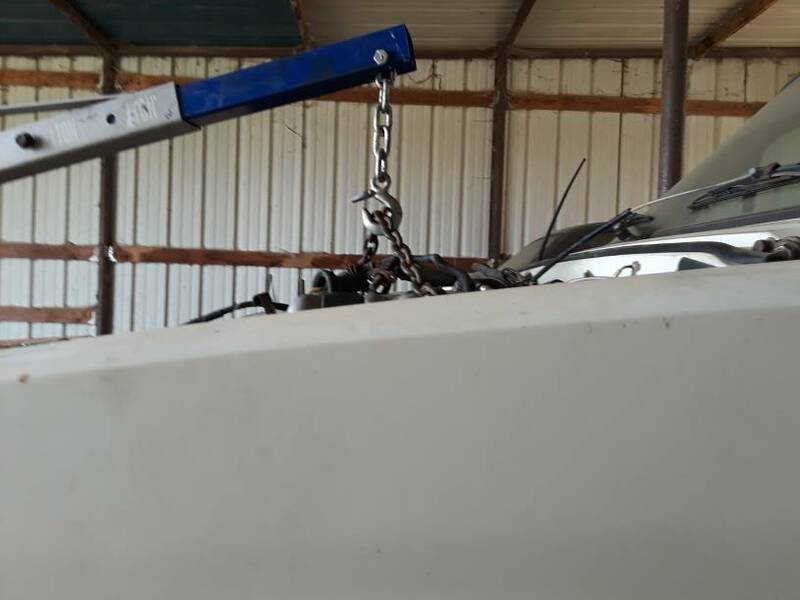 Then fabbed up some motor mounts and got the engine in it's new home. I got the resurfaced flywheel and clutch all in. I used the 5vz clutch disc, pilot bearing, and pressure plate. Then I used the 3vz release bearing for the 3vz r150f. The original clutch lines look like the will reach the new slave cylinder no problem. Next I'll be putting in the dual cases and welding in the new tcase mounts. One thing I've learned is to plate everything before adding mounts and brackets. It is crazy how thin the Toyota frames are. The 1inch body lift and new spring hanger did the trick but, I may have been too paranoid about hood clearance. 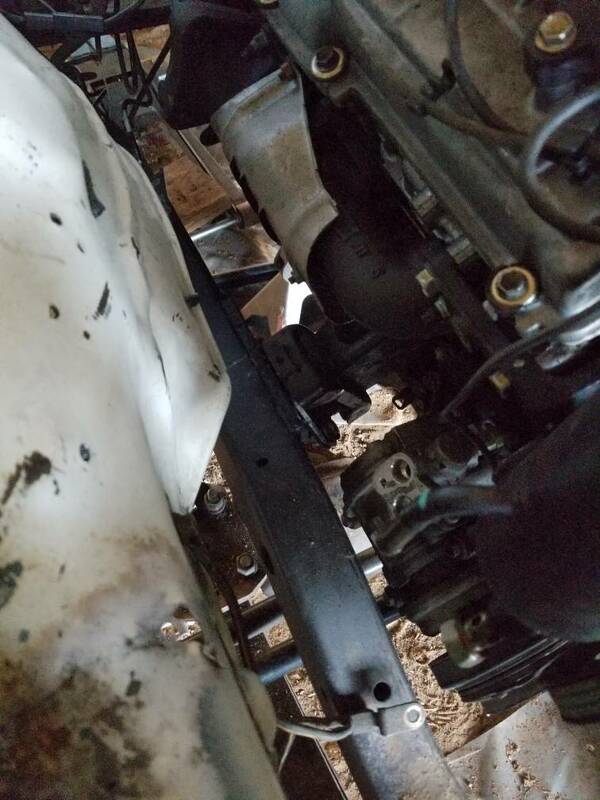 I have like 2 inches of clearance above the intake plenum but, the steering and axle should clear the oil pan through its travel. I got a 3row 3vz radiator from Ebay. 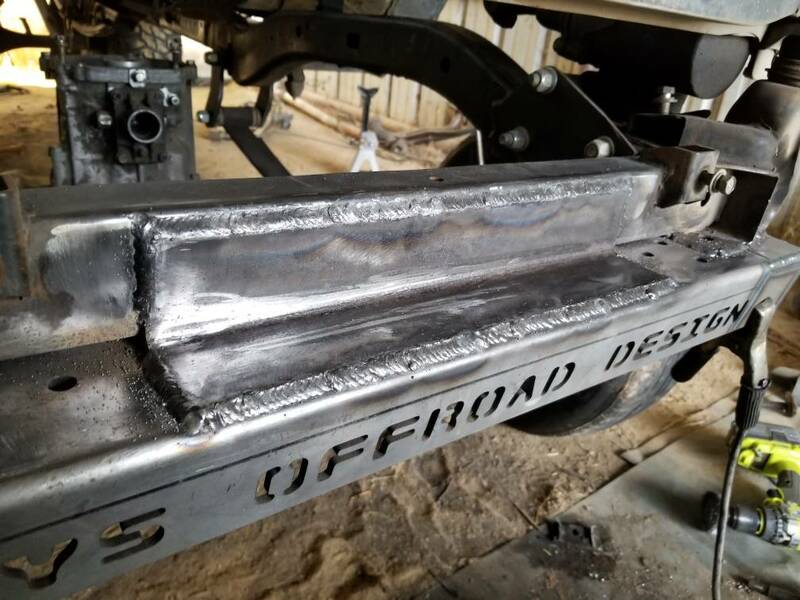 It will fit with some trimming and spacers. The 3vz radiator is a lot taller so the bottom hits the factory crossmember. 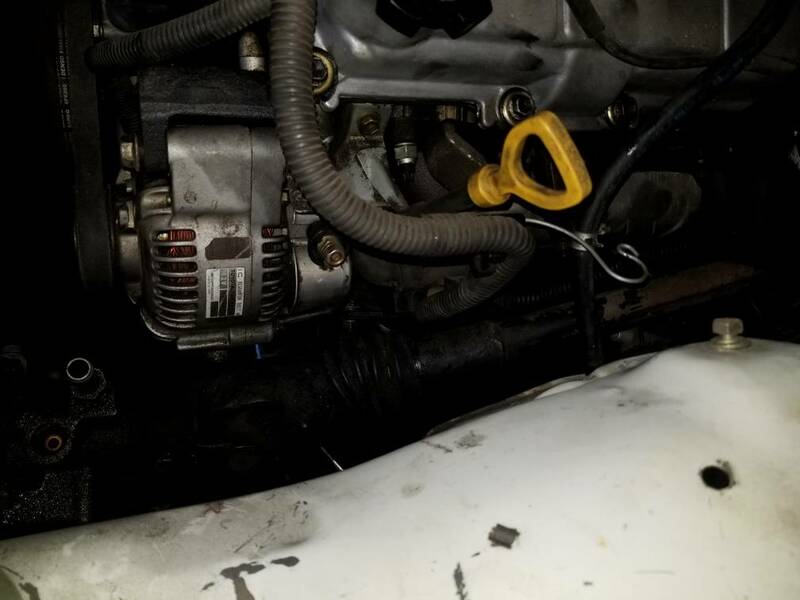 The intake tubing is ridiculous long and doesn't fit well in the engine bay. I don't know how permanent it needs to be to pass the ref inspection. 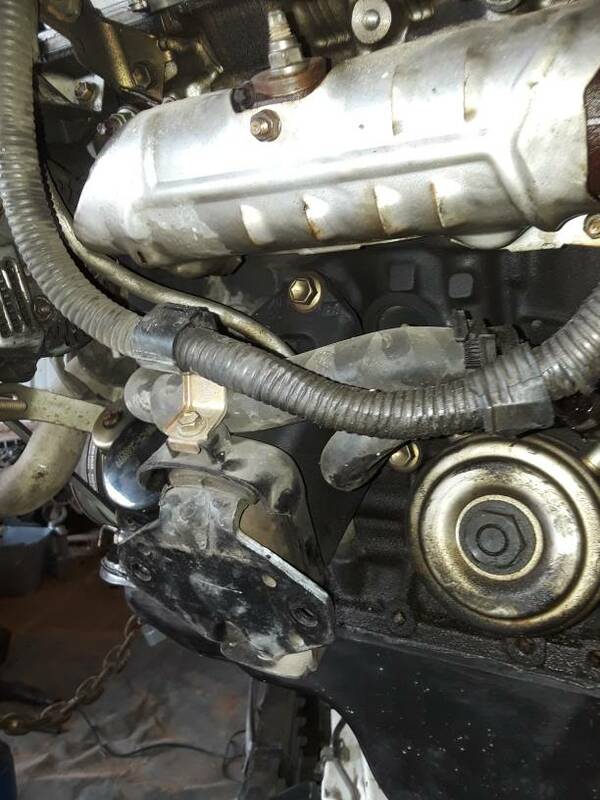 Also the 22r throttle cable is too short to reach the throttle body. It does look like the t100 cable should be a easy replacement though. Using tapatalk to upload pics is wierd. They should be in order of what I've typed. Page created in 0.44 seconds with 38 queries.